It reminded me of the gorgeous dresses Georgina of Fullerfigurefullerbust wears with ease. 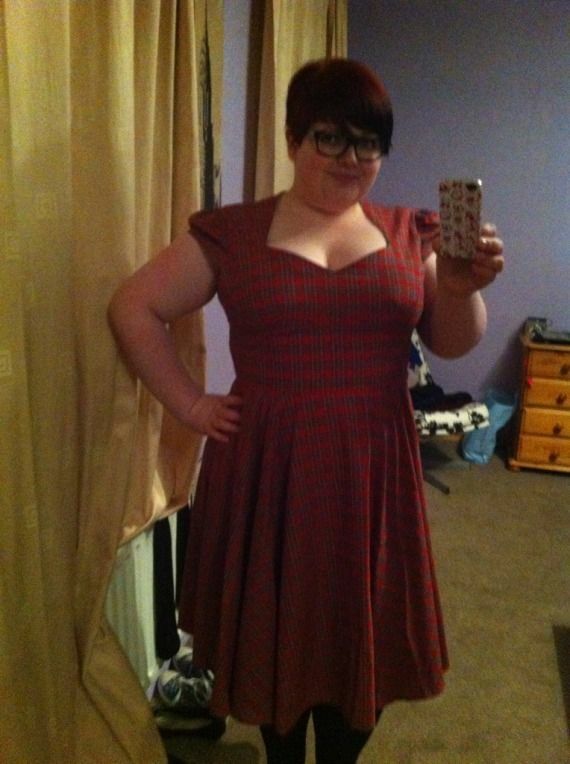 This delight is from a dress makers called "Polka Dot Polly" (their website is here). They have some dresses ready made (this is one of their ready made dresses) but also offers to make them to your measurements. 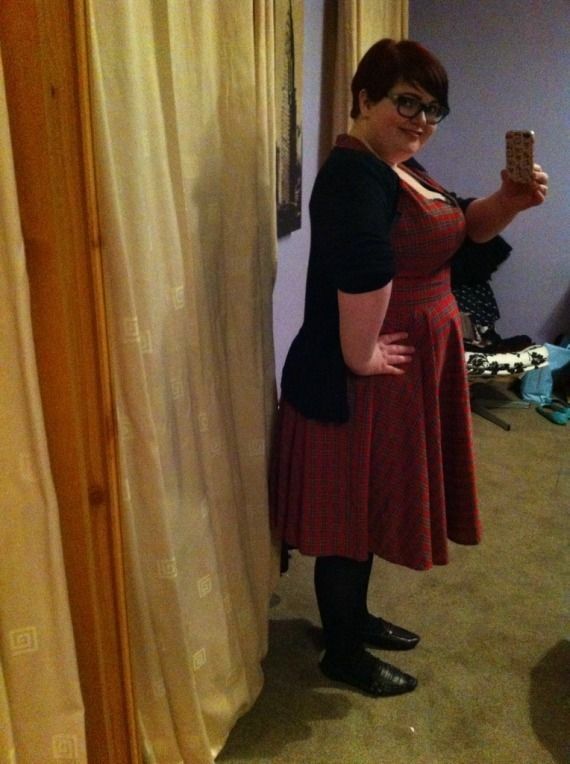 I was careful with the sizing this time (having learnt my lesson from this dress off eBay) and chose a size 24. When I came to actually wearing it, it was to a Comedy club I was headed to straight from work, so the dress got placed in a bag to be thrown on in the works toilets! I absolutely love everything about this dress - the cap sleeves, the fit and flare skirt (yet to be tried with a petticoat mind! ), and the print! That beautiful tartan print! It made people spotting me much easier: "I'll be the girl in a tartan dress!". 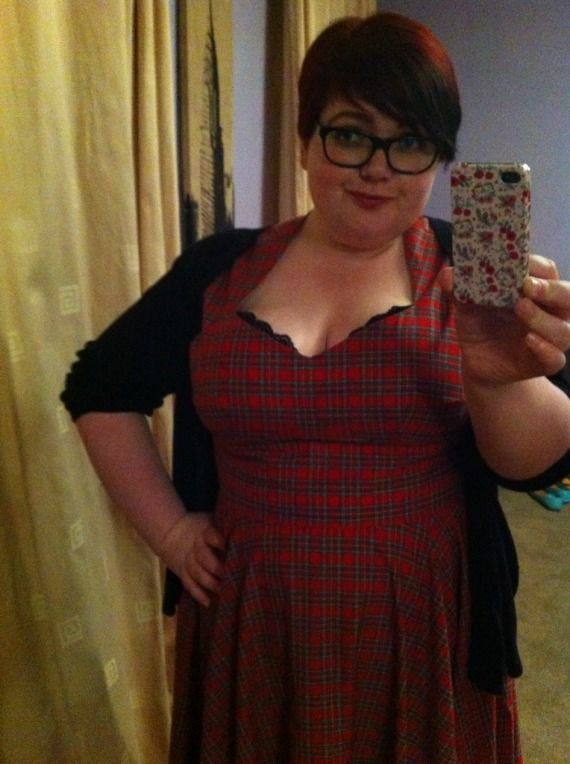 I think this Ewa Michalak bra was being too good a bra for this dress, it needed east / west syndrome back again! Not to be deterred mind, I went on to through caution and dignity to the wind and laughed with abandon! It wasn't hard, given the line up! It was a 'chat show' style affair, with the great Steffen Peddie (otherwise known as Big Keith in hit BBC Comedy Hebburn) as host. First up was Neil Grainger, otherwise known as Gervaise in the hit BBC Comedy Hebburn. Steffen guided us through Neil's career, taking in such delights as Cross Roads and Banged Up Abroad! Next up we had the two return to the stage along with Hebburn creator and star Jason Cook! Hilarity ensued! I can not put in words! It showed how difficult it must have been to get any work done with these 4 around!! I was unfortunately at the gig on my own, so pretty much stayed in my seat to ensure I kept it! I would highly recommend the venue, and the Big Owl Comedy Chat Show which is on every month at The Stand Newcastle. You look beautiful what a classy and sassy lady!